Sometimes a film just pops up out of nowhere and blows you away despite any faults it may have, I think Grave Walkers (also known as Live Evil) may just be one of those special films. It was directed by Ari Kirschenbaum (Bat $#! Crazy/Fabled) who also wrote and edited this quite strange comedy horror. Responding to reports of a disturbance at a manor on the outskirts of the small town Deputy Hancock (Charlene Amoia) is based at she discovers a whole bunch of dead bodies as well as a strange person with glowing eyes. She takes this being back to the station and locks it up only to discover it seems to exert a strange force on those around it, making them hallucinate that it is their worst enemy. This is just the start of the weirdness as soon people start coming back from the dead as unstoppable zombie like creatures who descend on the station. Teaming up with her fellow officers and a couple of F.B.I agents Hancock must try to survive this undead uprising as she awaits the arrival of the state police. 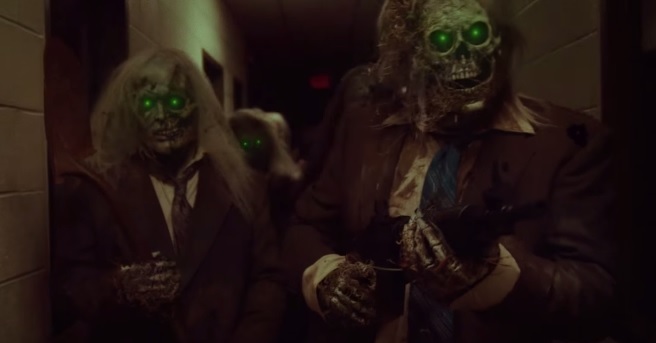 Grave Walkers is very much the epitome of style over substance, if not for that style this would not be anywhere near as enjoyable as I found it. The plot is confusing with a few too many sub-plots going on, most the attempts at comedy fall flat (the cast arguing over whether the undead are zombies or not, people reacting to recognised members of the returning dead) and the heavy reliance on CGI that at best is adequate all built up to bring this movie crashing down in flames, if not for the style that is. Interestingly the first half of the film is shot in black and white, the only traces of colour are art house style inset shots of seemingly unrelated objects and people standing in a white room. This black and white helped a lot with the CGI, gun shots and the demonic zombie like beings glowing eyes both benefited, it actually reminded me at times of Sin City in the almost fairy tale unreality going on here. A key event occurs pretty much dead on the half way point that brings colour into the world, this would be amazing and outstanding if not a similar thing had happened (to better effect) in A Plague So Pleasant. Once the world is in colour it took a while to adjust which was fun to have to do. In the coloured world the CGI certainly looks more fake, ash which rains down on the town looks like it isn't there, whilst the many, many zombies seem to show barely any damage no matter the amount of bullets they supposedly take, on the plus side the ghouls eyes look great. There is a lot of action here but due to the previously mentioned C.G.I none of it looks that real with guns in particular having frustratingly little impact on the world. There are explosions, flies, bullets, even some exploding heads that all look kinda fake and out of place. As Grave Walkers goes on the undead number increases dramatically. The initial ones are more human like, represented by actors with glowing red eyes, the later ones have some sort of zombie head mask on them that appears to have green L.E.D lights where the eyes should be, looked pretty special, though again a previous film I have seen (this time Invasion of the Undead) did a similar thing. The L.E.D lights are probably added in post production, sometimes the effects work fine, it's when they don't that they bring down the immersion. Unlike most films of the undead these ones are able to use tools and weapons (even one armed with a rocket launcher!) as well as open doors which is almost a first (plus the average head shot will not kill them). The plot unfortunately is really quite confusing where I don't feel it was meant to be so. Characters act irrationally at times, no one really seems to have any direction to them, racing around the town from scene to scene with no real incentive to be doing so. There were also a few too many characters in my opinion, this meant the more interesting ones got less screen time while more bland ones seemed pushed to the forefront. It was great to see the legend Tony Todd (Candyman) appear in a minor role and in general there are not many actors in the lead roles that do a bad job, more they suffer due to the script that at times thinks it's being more funny than it actually is. The whole sub plot with two criminals trying to escape town seemed like many of the sub plots to not really go anywhere interesting at all. Initially the story seemed to be extremely similar to Let Us Prey but branched off into less interesting territory, though it does have pretty cool cryptic chapter headings. Thankfully binding all this together is an amazing and very hummable score, it really helped make all the style congeal into a piece that while heavily flawed was at least charming and at times super cool to watch. While I could not rate Grave Walkers as a great film due to the sometimes dodgy effects and lack of a cohesive plot I still really loved it and had a lot of fun watching it. There are some stand out scenes that rival anything else I have seen this year in terms of the sublime editing and mashing together of music and visuals. 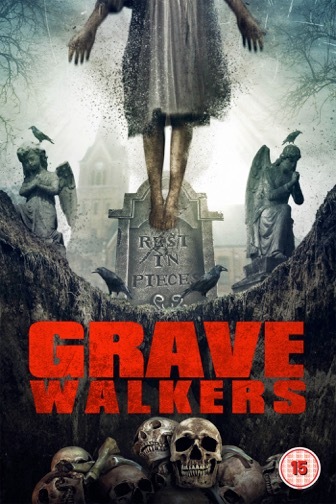 Grave Walkers came out on Digital 26th September, it is due to be released on DVD come 3rd October, both courtesy of Solo Media and Matchbox Films. Check out the new UK trailer below.